This pumpkin soup is creamy and comforting, but also has enough spice to be interesting. 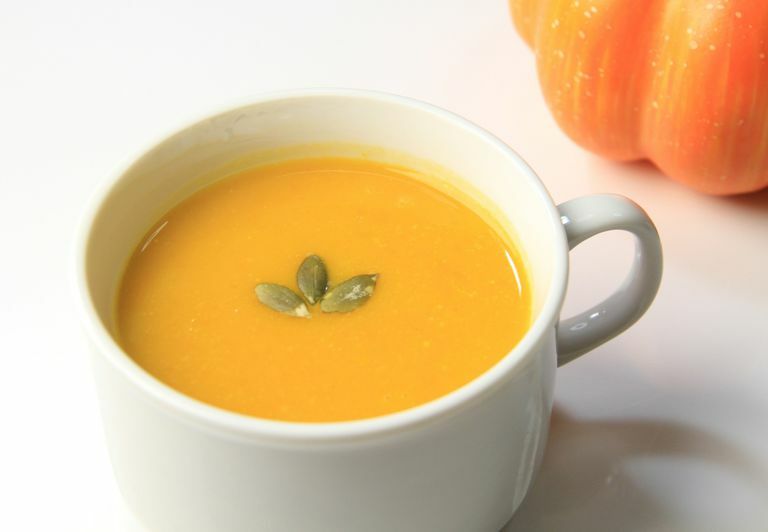 It is a healthier recipe than traditional pumpkin bisques you may find—instead of heavy cream, this version uses half and half, cutting down the fat and calories. And although only a small amount is called for, the recipe also replaces white refined sugar with a natural sweetener, such as stevia. This way, you can get all of the nutritional benefits of the pumpkin without all of the guilt. In a large pot (a 2-quart pot works well), heat the oil and saute the onions until soft. Add the garlic and ginger and cook for another 30 seconds, and then add the spices and cook for another 30 seconds or so (until fragrant, but do not let the spices burn). Add the wine, and stir for another minute. Remove from heat. Add the pumpkin and 1 cup of broth. Puree with a stick blender, or in a standing blender or food processor. When the soup is smooth, heat it in the pot with the remaining 1 cup of broth and the half and half until simmering. Taste and add a small amount of sweetener. Balance the flavors—add salt if needed and a bit more sweetener if the flavors seem a little harsh. You can easily double this recipe by using a large (29-ounce) can of pumpkin. If you're going to use fresh pumpkin, a sugar pumpkin is best. Place the pumpkin on a baking sheet and stab it with a fork several times to let out the steam. Cook it in a 350 F oven until soft—45 to 60 minutes depending on the size of the pumpkin. Split, let cool and scoop out the seeds and pulp. Remove flesh to a bowl and mash, or use blender or food processor until pumpkin puree is smooth. This recipe also works using butternut squash in place of the pumpkin. You can either roast a whole squash that has been cut in half and seeds removed, or buy already cubed butternut squash and add directly to the pot. If you want this soup to have more of a kick to it, add a little hot sauce or a small amount of raw grated ginger. Good garnishes included pumpkin seeds, bacon bits, or grated Parmesan or sharp Cheddar cheese.